ISLAMABAD, Pakistan (CNN) -- Pakistani Prime Minister Syed Yusuf Raza Gilani announced Monday that all judges sacked by the previous president, including Chief Justice Iftikhar Muhammad Chaudhry, would be reinstated. 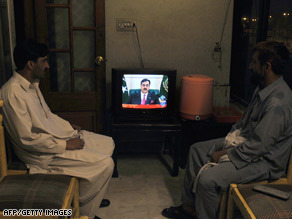 Men in a Rawalpindi hotel listen to Pakistani PM Syed Yusuf Raza Gilani addressing the nation Monday. "As per my commitment and the commitment of Asif Ali Zardari, I announce the reinstatement of all deposed judges," Gilani said in his address Monday after days of massive protests by lawyers demanding government action. Gilani announced the executive order and confirmed that the government is seeking a review of a court ruling last month that disqualified opposition leader Nawaz Sharif and his brother from public office and ensnared the country into a political crisis just a year after its return to democracy. Those arrested in protests during the last few days also will be released, Gilani said. The U.S. Embassy in Islamabad praised Gilani's announcement, saying in a statement, "This is a statesmanlike decision taken to defuse a serious confrontation, and the apparent removal of this long-standing national issue is a substantial step towards national reconciliation." Hundreds of lawyers held protests over the past week between Karachi and Islamabad, which demonstrators had planned to cap with a sprawling sit-in at the parliament building in Islamabad on Monday. The demonstrators touted different causes, but were united by one common grievance: dissatisfaction with Zardari's government. One group demands that the government immediately restore judges whom the previous president, Pervez Musharraf, had ousted. After sweeping into power in parliamentary elections last year, Zardari's Pakistan Peoples Party promised to reinstate the judges within 30 days of taking office. The deadline came and went. In protest, hundreds of lawyers -- and their supporters-- are in the midst of the "Long March." They plan to stage a sit-in at the parliament building in Islamabad on Monday. The second dissatisfied group are supporters of Sharif's Pakistan Muslim League-N (PML-N). They are angry that the Supreme Court last month barred Sharif from holding public office, citing a criminal record that dates to the late 1990s. The court also stripped Sharif's brother, Shahbaz, from his post as chief minister of Punjab. The political turmoil in Pakistan comes just a year after the country celebrated a return to democracy. It has forced the government's attention away from a deadly fundamentalist insurgency in its tribal areas and an economy that's on the verge of collapse. Police in Pakistan have fought running battles with stone-throwing protesters who defied a government ban on rallies and congregated in large numbers in Lahore. The procession had been relatively peaceful until it reached Lahore in the Punjab province, Sharif's home base. There, the crowd was incited by conflicting reports that authorities had detained Sharif to prevent him from leading the rally toward Islamabad. Officers in riot gear fired tear gas at the demonstrators near the Lahore Supreme Court. As soon as the sting from the gas wore off, the protesters regrouped, only to be chased away by police wielding batons. Authorities made several arrests. Ambulances were seen at the location. Soon afterward, Sharif emerged from his residence and told reporters he had been placed on house arrest but that he refused to abide by it. "This house arrest they have put me under, this detention, we don't accept this detention," he said. "My brothers, today don't be scared, don't be nervous. These obstacles are temporary. ... These must be brought down. Only by bringing these down can we reach our destination." Throughout the day, the opposition and the government went back and forth with claims and denials about Sharif's apparent detention. First, the party's acting President Makhdoom Javed Hashmi said Sharif was ordered confined to his residence for three days. The police detention order was meant to preserve law and order ahead of the march to the capital, Hashmi said. Then, Pakistan's Information Minister Qamar Zaman denied Sharif had been placed under house arrest. And the government of Punjab said police presence outside Sharif's house was part of security measures the government has taken to ensure a peaceful march. Several hours later, party spokesman Siddique-ul-Farooq said police had tried to serve detention orders but no one from the party received them. U.S. Secretary of State Hillary Clinton called Sharif on Saturday, as well as Zardari, a senior administration official said. The official would not provide details, but a statement issued by Zardari's office said Clinton expressed continued U.S. support for his government and said the United States wants to see a stable, democratic system strengthen in the country. Although a U.S. special representative to Afghanistan and Pakistan spoke to Zardari last week, Clinton's phone call is the highest level of U.S. intervention since the judiciary crisis began, and is seen as illustrating deep U.S. concern over stability within Pakistan. CNN's Reza Sayah and Zein Basravi contributed to this report.